A perfect picture of an Ideal alpaca! With several banners thus far, this girl is a wonderful addition to our foundation herd of elite females! 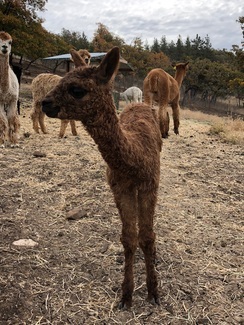 Grande has proven she can be part of the Rogue Suri Alpacas ET program. We flushed an embryo from her in 2017 and said embryo was born in 2018 thanks to a wonderful recipent mom! Grande is currently bred for a Natural breeding to Libertad's Notorious for a fall 2018 cria! If genetics are what you are looking for, then look no further! By way of his dam, a mulit Champion, futurity winning brown female that has been part of our ET program since last year. A very robust girl that has passed amazing conformation to Bronze Victory. His sire need no introduction, GLR Nico, who is still producing award winning crias and this guy is no exception. 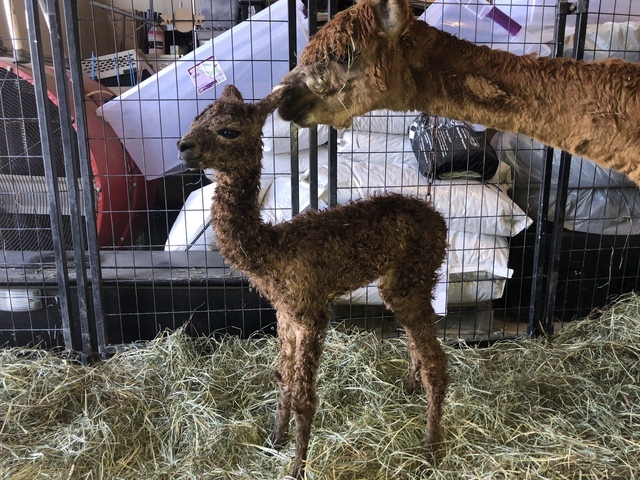 Born on 10/1/2018, he was the last of the crias for the 2018 year here at Rogue and we are very pleased. At first glance he came out looking Modern Rose Grey, we will see if he holds onto this color for the upcoming show season.